A 12-year-old schoolgirl was killed in a road accident this afternoon. 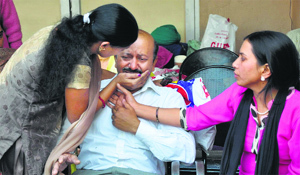 The deceased has been identified as Andrey Singh, a student of class VII of GMT School. She lived at New Aman Nagar in the Salem Tabri area. Two woman computer operators, Jaspreet Kaur and Razia, have been suspended by the Municipal Commissioner for misappropriation of water-supply and sewerage bills. The city police claimed to have busted a gang of looters with the arrest of six of its members today. The police recovered weapons and narcotics from their possession. The accused have been identified as Deepek Ghai, alias Ganja, resident of Partap Singh Wala; Amandeep Singh, alias Baau, of Malikpur village; Sandeep Singh, alias Billa, of Haibowal; Lakshay Khurana of Durgapuri; Santosh Kumar of New Kundanpuri; and Vinod Singh of Haibowal. The decomposed body of a woman, aged about 30 years, was found near Katani Kalan village here today. Child Task Force rescued eight child labourers from different parts of the city today. It seems the organisers of Jagannath Rath Yatra being taken out here tomorrow have taken the Swachh Bharat message well. The Bhagwan Jagannath Rath Yatra Mahotsav Committee has deployed around 500 volunteers of different non-government organisations for cleaning the route as the yatra proceeds. The city is all decked up for the massive Jagannath Rath Yatra to be taken out tomorrow. Hundreds of stalls, hoardings and banners have been displayed on major roads, at rotaries, especially the yatra route. Mudslinging has kept members of the Ludhiana Effluent Treatment Society (LETS) preoccupied ahead of the elections. The last date for e-filing of annual statement in Form VAT 20 has been extended till December 10, 2014. A public notice has been issued by the department in this regard. Deputy Commissioner Rajat Aggarwal has written a letter to the MC Commissioner to hold meetings of the Anti-Encroachment Committee on a regular basis. Senior Medical Officer, Civil Hospital, Dr RK Karkara, has replied to the show-cause notice issued to him by the Health Minister on Tuesday. 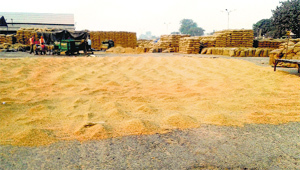 Even as the arrival of paddy has almost stopped and most of the produce has been procured by government agencies and private rice millers, the local grain market, Asia’s second largest, still awaits lifting of a huge stock of paddy. Punjab Revenue, Information and Public Relations Minister Bikram Singh Majithia today claimed that all is well between the SAD and the BJP. 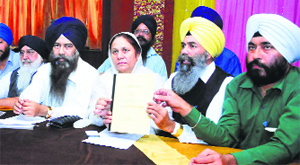 Gurdeep Kaur, the president of Istri Wing of “1984 Sikh Katle-Aam Peerat Welfare Society”, and the Sikhs for Justice (SFJ) have given a representation to the Secretary, United Nations Organization (UNO), seeking justice for the 1984 riot victims. To find solutions to the problems faced by adolescents, a national conference “ADOLESCON- 2014” began at Dayanand Medical College and Hospital today. Cancer super-specialist and executive chairman of the Cancer Council of India (CCI) Dr Devinder Singh Sandhu delivered a lecture on cancer awareness at the Sandhu Cancer Centre. Class XII students of Government School, PAU, attended the seminar. Doctors have warned heart patients against going out for morning/evening walks. For the lovers of exotic food, ‘Singaporean Food Festival’ has brought flavours from South-East Asian countries. On the second day of the Bal Swachhta Mission, schoolchildren carried out cleanliness drives in and around educational institutions. Although the DGSE office has rolled out a schedule for the cleanliness activities, specifying the theme and major activity to be conducted, most of the schools are not following the schedule and carrying out cleanliness drives. 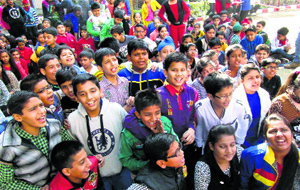 Ludhiana: Kids Carnival was organised at St GDS Convent School. Various activities such as clay modelling, best out of waste, fashion show and collage making were held. Four students from every school participated. The Income Tax Department organised the Central Revenue Sports and Cultural Board (North Zone) Sub-Zonal Sports Meet at the athletics stadium in Punjab Agricultural University, Ludhiana. Several track and field events along with indoor and outdoor competitions were held during the meet. 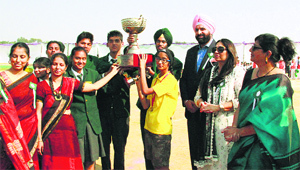 Nishi Singh, Chief Commissioner of Income Tax, Ludhiana, who was the chief guest on the occasion, presented awards to the winners of different events. YD Banga, Commissioner of Customs and Central Excise, gave the closing address. The Khanna police claimed to have arrested six youths and recovered two pistols and ammunition from their possession. The police today booked a person for selling duplicate products at MBD Mall. The Sadar police have arrested three drug peddlers in two separate cases and recovered a haul of illicit liquor and pharmaceutical preparation being used as narcotics. A motorcycle used in the crime has also been seized. Three unidentified motorcycle-borne youths looted around Rs 11,000 in cash from a liquor vend at Morkareema village near Chaunkiman on Friday evening.